If you are looking for a way to change and heal your life, hypnosis is a wonderful way to learn to relax and eliminate the habits which do not enhance your life. It is also a wonderful way to connect with your higher self, the part of you which knows why you are here in this life on this planet and which knows how to increase your level of focus and joy. It ultimately directs you to search and find your spiritual purpose. Hypnosis can be used for the purely physical or emotional ailments that you have or move you beyond this to a greater clarity into the "why" you are here. It is a fascinating journey to begin and one that never ends. I am so surprised that this worked on me. I'm surprised it'd work on anyone, but it's actually really an amazing experience. I wish I had tried this ages ago. Turns out that I am more susceptible to suggestion than I would have thought. It is so much easier though to have someone else tell you to stop doing something than it is to do it on your own. I used to be addicted to eating. I mean, in a serious way. It was making me overweight and it was interfering with my life. Whenever I got depressed, the bad foods came out! And I couldn't stay away from food without thinking about what I was missing. Hypnosis was a really weird idea to me, I thought it was some hokey stuff! But when I tried it, I was surprised! They not only help you to get into a mindset where it's easier to teach yourself to change, but they teach you how to do it on your own so that you don't actually need to keep going in. I used to think hypnosis was a scam, but it's really not. Ooh, and did I mention they do reiki here too? That's another one I didn't take seriously at first. But it really does help! It's helped me to deal with these annoying little stress headaches I get. I went to East End Hypnosis to deal with my overeating problems, and I was pleasantly surprised. It's not like it's the end-all-be-all answer to all of life's problems (nothing is, right? ), but it helped me to get my mind into a place where it was easier for it to accept new patterns of thinking and positive reinforcement. What's really cool is once you've gone in a number of times, you start to get to know that state of being where it's easier to accept new information, and you can kind of get yourself into it when you're on your own, and then tell yourself positive, useful messages. Even though I come from quite far away, I find East End Hypnosis to be a really soothing experience for me. They were recommended to me by my best friend, who had found cure in her severe stress that was troubling her for years. I met them and I had a nice talk with them. They seemed friendly enough and quite professionals in their way of doing business. With hypnotism, I was able to reach my mental health and overcome any troubles and bad thoughts that were intimidating up until now. I even managed to quit smoking with their valuable aid. It is real science, do not let anyone tell you otherwise. 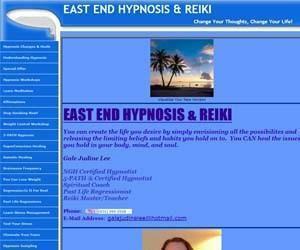 I can guarantee that you will see results if you start at East End Hypnosis. I'm a little overweight, and I was told that hypnosis might help me in controlling my desires to eat. Well, I tried it through East End Hypnosis, and for me it didn't work. The experience did relax me however, and Gale was wonderful. I might give it another try later on. I thought I'd try and use hypnosis to help me quit smoking, well I tried East End Hypnosis, and while they offered great service, and a nice relaxing atmosphere, it didn't work for me. Now, it might work for you, so I encourage you to try whatever methods you can to quite smoking. Do you have any experience using East End Hypnosis? If so, please rate your experience and let others hear about it using the form below.